The ASUS PEI-10G/82599-2S is designed to take advantage of high-performance 10Gb/s connectivity technology to meet the need for faster rates of data transmission. Through the PEI-10G/82599-2S Ethernet adapter, users are able to enable fiber solution over SFP+ LR optical module and SFP+ SR optical module, or to enable copper solution over direct attach passive twin-ax cable. This flexibility is ideal for different distances and network architecture requirements. 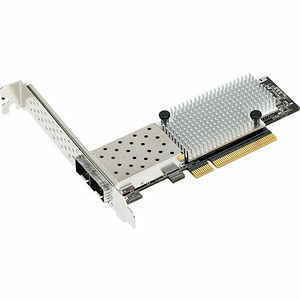 The ASUS PEI-10G/82599-2S adapter is based on Intel® 82599ES 10GbE controller and is designed in a smaller 4.72"x 1.77" form factor. The 4.72"x 1.77" form factor is even smaller than standard low-profile MD2 form factor; thus allowing customers to integrate the adapter in space-limited systems easily and flexibly. PEI-10G/82599-2S provides a flexible and perfect fit for various server integrations. The ASUS PEI-10G/82599-2S Ethernet adapter provides a flexible, scalable, and affordable approach for customers who wants to upgrade interconnect speeds from the current 1Gb/s to 10Gb/s. With the PEI-10G/82599-2S Ethernet adapter, users are able to tap fiber technology over SFP+ SR (short range) and LR (long range) optical modules, or to enable copper solution over direct attach passive twin-ax cable. SFP+ fiber solution is suitable for longer distance communication, while SFP+ direct-attach copper solution is best when utilized in short lengths, typically 5m or less, which is sufficient to link server cards and switches. By applying with different module types and cables, the PEI-10G/82599-2S Ethernet adapter can meet a wide range distances and various customers' needs for different network architecture.